The vehicle comes with a complete on-board folder with service record and owner’s manual as well as the full tool kit. Before delivery this Mercedes-Benz classic car receives a comprehensive service, a new safety inspection, an exhaust emissions test (HU/AU). With the 12-month warranty from ALL TIME STARS, the car will give the future owner further driving pleasure. For further questions please contact us at any time. The legendary gullwing coupé was the first true sports-car to be developed by Daimler-Benz after the war. 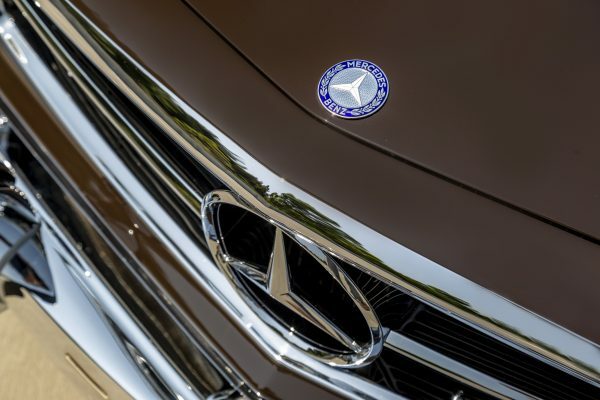 This development was initiated by Max Hoffman, a US-American citizen of Austrian extraction, who had been the official importer of Mercedes-Benz cars since September 1952. For the board of directors of Daimler-Benz, Hoffman’s plan to sell sportscars with the Mercedes star on the bonnet, was a welcome opportunity to open the US-market for Daimler-Benz and so they were easily persuaded: In September 1953 the development of two sports-car models was launched.The serial version of the 300 SL, which was presented as the result of this development in February 1954 at the “International Motor Sports Show” in New York, was based on the racing-car of the 1952 season. Its salient feature was taken from this racing-car, the unusual doors, which earned the car the nickname “gullwing” in English-speaking countries. This unusual design solution was not intended as a publicity stunt, but, as had been the case with the racing car, from a construction point of view, this was an absolute necessity. The tubular space frame, derived from the SL racing-car, which weighed a mere 50 kg, had the drawback that because of its overall height conventional doors were simply not feasible.The streamlined body concealed several other novelties: for the first time fuel injection was used in a serial car by Mercedes-Benz; this resulted in an increase of horse power of 40 hp as compared to the carburettor racing car model. The motor was inclined towards the side, in order to ensure a flat and streamlined front design. The lightweight construction – the complete car with spare tire, tools and fuel weighed only 1295 kg – led to the sensational driving performance of the 300 SL: Depending on rear axle transmission a maximum speed of 235 kph to 260 kph could be achieved.From August 1954 until May 1957 1,400 units were built in Sindelfingen, 29 of them with a light-alloy body and one test vehicle with a plastic body. This individual car with a glassfibre reinforced body can easily be recognized by two features: there are additional indicators on the front mud guards, which had also been carried over from the 220 a, and there were bigger gaps between its door panels, so that there is no flush surface when the doors are closed.At the Geneva Motor Show in March 1957, a roadster was presented as the successor of the gullwing model. 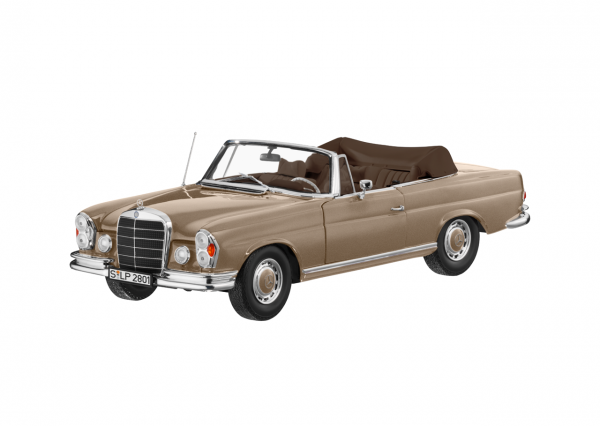 Like its predecessor this was an initiative by Max Hoffman – he had urged Daimler-Benz for some time to build an open version of the 300 SL model, as in his view the sales opportunities for this kind of car to be particularly good. Technically the roadster corresponded more or less to the coupé. By modifying lateral portions of the space frame entry height was so much reduced that normal doors could now be incorporated. Rear axle suspension was completely revised and improved: the single joint cross shaft axle of the 220 a with lowered pivot was adjusted and incorporated into the 300 SL Roadster. For the first time it was fitted with a compensating spring. Compared to the original jointed cross shaft axle of the gullwing coupé, the roadster delivered a far better performance. From October 1958, a removable hardtop was available as special equipment at an extra cost of 1,500 DM. Remarkable features were the rear window, which extended far around the corners and the attractively styled design of the hardtop. Of the technical changes, which were undertaken during the following six years, two should be mentioned: In March 1961, the 300 SL model was fitted with Dunlop disk brakes at the front and rear wheels and from March 1962 a modified engine with a light-alloy block was incorporated. A special version of the 300 SL Roadster should be mentioned at this point: the two 300 SLS models which were built for the American Sports Car Championship competition. The reason, why these special versions were built was the fact that, once production of the roadster had been started, the car was to be used in publicity sportscar competitions in order to boost sales. However, The “Sports Car Club of America” refused to admit the standard serial version of the car to the “standard production”-category during the 1957 season. In order to have a chance in the only possible sports car Category D, the serial roadster was trimmed down as much as possible and made into an SLS model. The exterior of the 300 SLS is characterised by missing bumpers, a special cockpit cover with air admission ducts, a small racing-type wind-screen and a roll bar behind the drivers seat. In any case, the work carried out by the Daimler-Benz testing department was successful: Paul O’Shea won the American Sports Car Championship in the Category D with a clear lead. Production of the 300 SL and the 190 SL in Sindelfingen ceased on 8 February 1963. 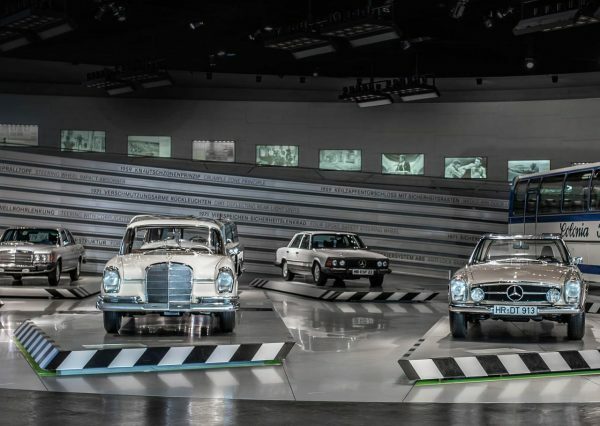 This date marks the end of an epoch for Daimler Benz: as the production of the 300 saloon had ceased in March 1962, this meant that there were no longer any cars with a separate chassis being produced. Both versions of the 300 SL, roadster and gullwing coupé, were collectors’ cars right from the start and still have not lost any of their fascination; they have been amongst the most sought after and valuable classic cars for many years now.